Luke Shaw says he is "doing fine" after being stretchered off with a head injury in Saturday's UEFA Nations League defeat to Spain. The Manchester United left-back - making his England return after 17 months - hit the turf hard after being caught on the head by the forearm of Real Madrid's Dani Carvajal, in what appeared to be an accidental collision. Shaw received treatment for around five minutes before being escorted off the field on a stretcher wearing a neck brace and oxygen mask, after the incident occurred in the 48th minute of England's 2-1 loss. England confirmed after full-time that "Luke is awake and alert, having been assessed by our doctor and given an X-ray. He'll stay with us overnight for further observation, with another update to come in the morning". Shaw later tweeted to say: "Thank you for all the love and support. I am doing fine and in the best hands I'm a fighter so I will be back soon." Shaw will, nevertheless, follow all the correct protocols following concussion, which will include close monitoring for 24 hours, and then a staged return to activity as long as he is symptom-free. 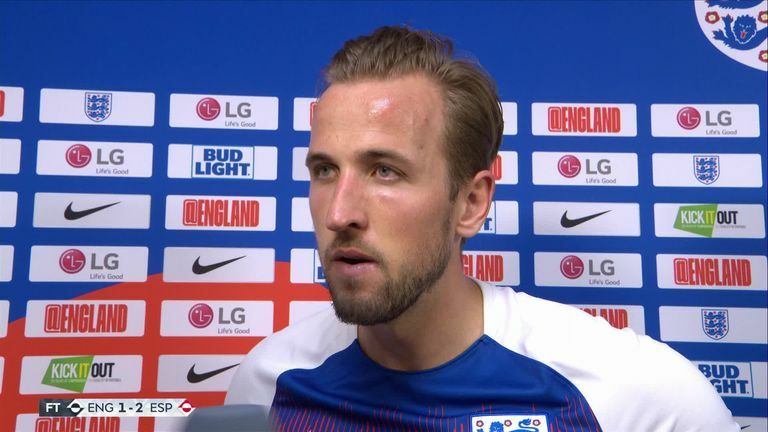 He will not train with England again before their game against Switzerland on Tuesday night, which Sky Sports News understands he will not feature in. No decision has been taken on whether he will return to Manchester. Sky Sports' Gary Neville, commentating on the match, described the incident: "He took one on the initial challenge, but it looked like his head then struck the ground as he fell. It was a double impact. "The initial challenge was clumsy, but it was the fall to the ground that caused Luke Shaw the big problem. "The attention now given to head injuries is a lot better. They are a lot more careful than in years gone by. The game always gets stopped and there is immediate attention. "He got a great ovation. There's a great level of concern, let's hope he is okay. He has had some bad luck." United manager Jose Mourinho watched on from the stands with a concerned expression, as well as Tottenham boss Mauricio Pochettino who helped launch his top-flight career at Southampton and has maintained an interested in taking him to Spurs. Shaw impressed during his time on the field, setting up club team-mate Marcus Rashford - who was also substituted late on and went straight down the tunnel after appearing to gesture a knock towards the bench - for England's opener. Shaw was replaced by Danny Rose for the remainder of the game - and another Tottenham player in England captain Harry Kane wished Shaw a speedy recovery in the immediate aftermath. "It's never nice to see one of your team-mates go down, especially like that, it looked horrible," Kane said. "I haven't seen Lukey yet, so hopefully he's all good but it's never nice for anyone to see that."